Now that our neighborhood is covered with snow, new visitors are showing up to feed. I hadn’t seen Goldfinches for several months until this week, when a small flock stopped by for a few days. I’ve also enjoyed watching a Red-Bellied Woodpecker work on the suet alongside the Downy Woodpeckers, which have been regulars through the winter, and many more Dark-Eyed Juncos and sparrows are on the hunt for the seed dropped on the ground. The only birds conspicuously absent this winter have been the Cardinals, and I’ve missed their red plumage that brightens up these cold, gray days. Thank you! I was so glad to see these birds, as they add such lovely color to the winter landscape! What a beautiful bird. A wonderful picture. 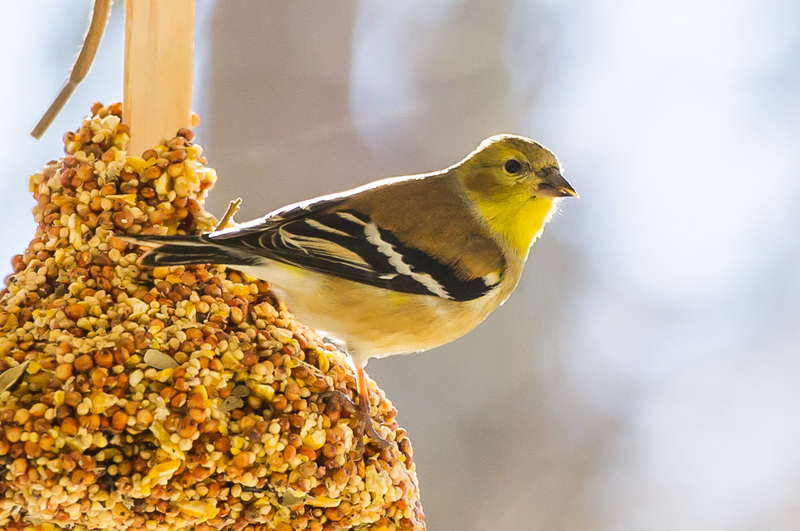 That’s odd that your usual visitors aren’t at your feeders this winter. This is a lovely capture of this goldfinch. Funny, the Cardinals are here today…the ice is heavy and they are hanging out at the feeders. I wonder where they are during the other days?